Our understanding of the world around us and the ways we react to the events that occur in life are deeply effected by our understanding of death, and what we believe happens to us after death. 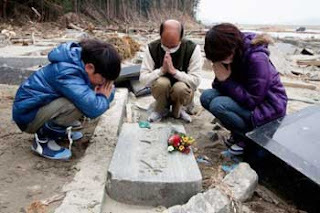 In a recent article on Japan's recovery following the catastrophic tsunami last year, cultural anthropologist, Takeo Funabiki offers some insight into the phenomenon of tsunami ghosts. Funabiki said it was only “natural” that stories of the supernatural abounded in the wake of such an event. “Human beings find it very difficult to accept death, whether they are inclined by nature to superstition or are very scientifically minded,” he told AFP. “A sudden or abnormal death, anything other than someone dying in bed of old age, is particularly difficult for people to comprehend. “When there are things that many people find difficult to accept, they can find expression in the form of rumours or rituals for the dead, amongst other things. “The point is that it takes the shape of something that you can share with other people in your society,” he said. For some of those who lost loved ones, the traditions that usually accompany death in Japan have served their purpose. Shinto priests have been called upon to console the souls of the dead and ease their passage into the next world before they purify the places their bodies were found. At the Buddhist festival of Obon in mid summer, offerings were made at altars as those left behind readied to welcome back the spirits of lost loved ones, who they believed would return to this world to visit for a few days. But other people have struggled to make sense of their loss. Koji Ikeda, a therapist and lecturer at the Academy of Counselors Japan, said “survivors have various complex emotions — fear, anxiety, sorrow or desire for the return of deceased people”. “It is possible that a whole lot of emotions that people cannot fully cope with lead to ‘projections’ of spirits” he said. While few in the city will talk openly of actually having seen a ghost, many are prepared to accept spirits could stalk the deserted streets. Actual undertaking has occupied all of my attention in the last weeks as the communities I serve said goodbye to some of our oldest and youngest members. They were all very different services, but like the two stories that caught my attention in the news recently, ritual and participation helped to make them meaningful and healing. 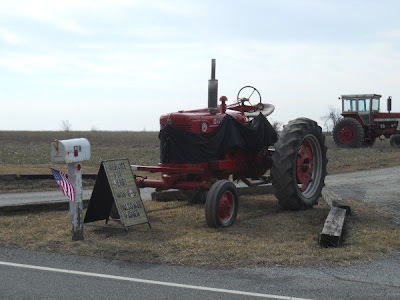 In rural New Jersey, the funeral procession for 86 year old farmer, Jerry Cervenka wound its way through his farm and lifelong home on the way to the cemetery. The procession is one of the oldest of funerary traditions, and presents a wonderful opportunity for personally meaningful rituals. In Mr. Cervenka's case, the tractors and farm trucks, many that had been a part of his daily life for decades, were lined up to pay silent tribute to Mr. Cervekna as he visited home one last time. Borrowing a page from Victorian rituals, the lead tractor was draped in a black cloth. I have been involved in many processions like farmer Cervenka's that took 'the scenic route'. Sometimes it is a loop around the farm, sometimes a last stop at the lake house or business. They have been done on the way to the funeral, on the way to the cemetery, or even just a special drive taken the day before services. In every case, they have been emotionally powerful reminders of what has been most important in life. Most notable in these rituals is their physicality. The mourners in each case believed firmly that the spirit of the deceased was no longer one with it's earthly body, but bringing that body to the special places had meaning, just as carrying that body, or saying goodbye to it does. Acting out these rituals physically has the power to transform our experience of the spiritual in ways that talking and intellectualizing just cannot accomplish. This is why we gather physically to engage in ceremony along with the remains of the deceased. In Puyallup, Washington, 7 and 5 year old brothers, Charlie and Braden Powell were lowered into the ground, sharing the same casket. The victims of their father's murder/suicide, the emotional pain and grief involved was overwhelming for family, friends, and everyone involved. Certainly nothing in the funeral service could take away the tragedy or horror of what lead to the boys death. Looking beyond the way things are usually done and burying the boys together, however, must have provided a level of comfort to the bereaved. Participation in an improvised ritual, also helped the survivors express their love of the boys with a meaningful goodbye. 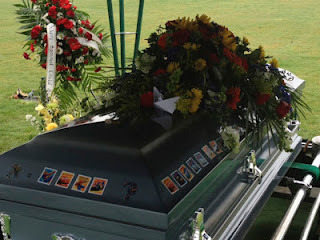 "A group of nine family members gathered around the casket for a dedication, before the boys’ aunts handed out Lightening McQueen stickers from the movie “Cars” as well as Spiderman decorations to adorn the sides of the casket. In funeral service, it is easy for directors and families alike to concentrate on getting things done efficiently, and demonstrating respect and reverence in familiar ways. Straying from these norms in creative ways can be daunting and risky, but it has the potential to make the whole service more meaningful and memorable. Its easier to just drive straight to the cemetery, or go with convention and bury each boy in his own casket. We might want to avoid the appearance of disrespect by covering a casket with children's stickers. It is up to us as mourners, however to make the most of our expression of love; and it is up to us as undertakers to facilitate this expression. Currently in search of backing on KickStarter is a notable project that is very dear to my own heart. 'My friend Mott-ly' is a film being produced by documentarian, Chris Snipes about the short and inspiring life of a wonderful artist and mutual friend. My Friend Mott-ly is a testament about the life of a dear friend that ended all too soon. Mott-ly was dealt a bleak hand at birth, yet seemed to be able to employ some arduous alchemy to transform a considerable amount of suffering into an ever-deepening well of empathy and art. In this documentary, I attempt to chronicle his life as an homage to the person he was and in an attempt to relay the phenomenal impact he had on the lives of those who had the honor of knowing him.I spent the last four years interviewing over forty of Mott-ly's friends and family members. I have whittled over one hundred hours of footage into a two hour film. This experience has had a tremendous impact on my life and the lives of those who loved Mott-ly. 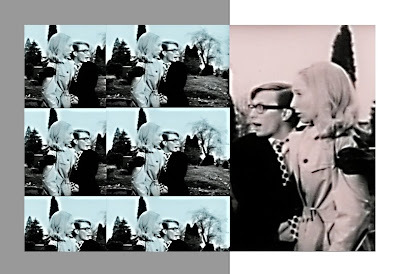 Currently, I am in post-production, and the film will premiere June 2 at an art gallery in Kansas City, MO. This gallery is owned by a dear friend of both Mott-ly and I. It will also screen in Lincoln, NE, Mott-ly's birthplace. I then plan to enter the film in Sundance, SXSW, Tribeca, and a few other film festivals.The money that I am hope to raise here will go toward: Editing software, music licensing fees, entry fees for film festivals, travel expenses, equipment, and the production and manufacturing of DVDs.For the most part this project has been a labor of love. I have paid for all the expenses out of pocket up to this point, but the expenses remaining cannot be accommodated by my income. Anything that you can give will help immensely. Please also consider that if I do not meet my financial goal, I do not get any of the money. Donors pledge an amount, but don't actually pay anything until the goal has been reached and the funding deadline has passed. So, please spread the word! I would love to see this film get out to an extended audience! Come one and all! This is your final opportunity to have a guided and animated tour entitled “The Kiss of Death” narrating the end of the Bridgehampton Historical Society’s current exhibition featuring the customs and practices surrounding death & mourning in the mid to late 19th century. This final ‘Curator’s Talk’ will be given by the society’s popular and knowledgeable Archivist and Curator, Julie Greene, and will take place Thursday, February 16th, at 11am. Reservations can be made by calling the society at (631) 537-1088, or emailing them at bhhs@optonline.net. 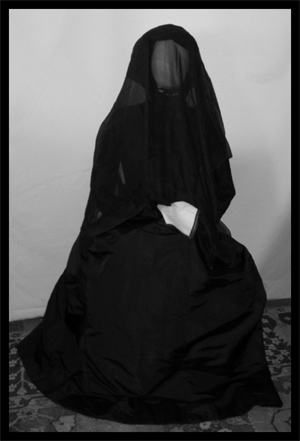 On exhibit are materials depicting Victorian mourning customs based on a strict set of rules that upper and middle class families strove to follow. The responsibility fell mainly on widowed women, who were expected to grieve for as long as two and a half years. Their clothing often progressed through several stages of mourning. Homes were also decorated in times of mourning. Black crepe draped on the front door was the solemn symbol that a household was mourning the loss of a loved-one, and throughout the home mirrors and paintings were covered or draped in black. Great Britain’s Queen Victoria, devastated by the premature death of her husband Prince Albert in 1861, remained in mourning for the remaining forty years of her life. Her immense popularity among Britons and Americans created a “cult of mourning” on both sides of the Atlantic that survived the Queen’s own death by decades. Visitors to the Corwith House Museum will experience a re-creation of this era. Throughout the museum period artifacts, artwork, and mourning fashions and jewelry will illustrate Victorian customs associated with death, grief and condolences. France, which is home to a six million Muslim minority, has seen the opening if it's first official Muslim Cemetery in Strasbourg. 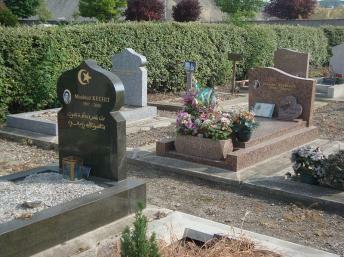 Until now, French Muslims had few options other than Muslim only sections in public cemeteries and repatriation of their dead back to their lands of origin. Because of strict regulations requiring Muslims to be buried as soon as possible following death, ritual washing and prayers, the cemetery will greatly facilitate the ability of French Muslims to follow the dictates of their faith. The creation of this official cemetery also sends a message of acceptance and integration. “If a religious community is to feel entirely at home in a city, it must be helped in building places for worship and for the burial of its believers,” said Strasbourg Mayor Roland Ries. Long before English Poet, Edward Young wrote those words in his play The Revenge, the great majority, was a common idiom referring to the dead. There had simply been many more people who had died than were currently living. Life was a side show to the real event, and when we died, we entered the big tent. Perhaps it is easier for us in the New World to forget this home truth than it is in more continually populated places in the world, where one literally cannot take a step that was not trod by countless deceased predecessors. As bracing as this thought is, it puts our human situation into sharp focus. Now we have another bracing thought. As our population skyrockets, will there come a day when there are more of us alive than have ever died? Is that day here? BBC news published an article yesterday that does the math for us. 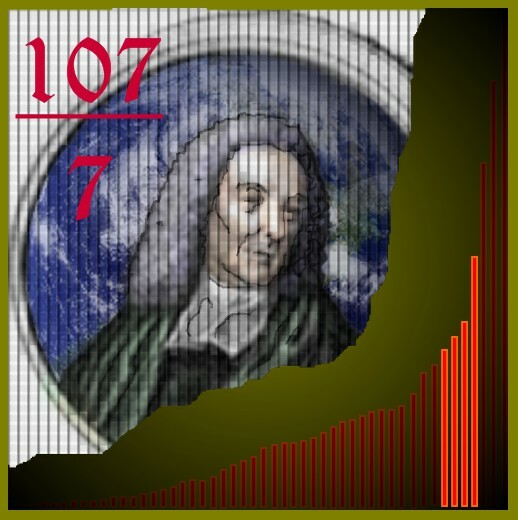 Many very interesting variables are taken into account, but visit the article yourself to appreciate what goes into the equations. The numbers come out like this; currently there are approximately seven billion of us alive. A whopping big number, and more that have ever walked the earth at once, but calculations also reveal that over 107 billion have come before us. This is certainly an overwhelming majority, and one that the earth's resources could never maintain at once. Souls aside, that's a hell of a lot of dead people. In order for that many bodies to have been absorbed by the earth, some serious recycling has been going on. The building blocks of all of those bodies must be all around us and may even be a great majority of what makes up our own bodies. Which brings us to another bracing thought, and another quote; this time from George Romero, creator of the Living Dead series, and pioneer of the zombie genre. the dead will walk the earth. In light of the BBC article, Romero seems to have gotten things backward, since there seems to be much more room for the dead in hell than there is on earth. But what does this staggering number mean to us metaphysically? We may accept that a higher power can make a place for a million souls, and it requires only a small additional leap of faith after that to accept that there is room for over a hundred billion in the hereafter. But what happens when the saints come marching in? How do I find grandpa when I get to heaven, hold up a sign? There is some comfort in the idea of reincarnation. That could go a long way to explaining where everyone is coming from and going to; it would mean that there is a more fixed number of souls that keep passing through, resulting in a much smaller number of dead. If this is the case, however, how did we go from 500 million in 1500 AD up to seven billion in 2011? Unless we've got an ever increasing number of new souls, it doesn't look like our chances of breaking out of the cycle are very promising. These are questions that are clearly beyond me, so let's come back where we started. Life may not be the desert of solitude that it once was, now that seven billion of us walk the earth, but we're still just a sideline. The great majority is still on the other side. Let's hope they stay there! The Thursday Midweek Herald gave me quite a wince. The Rev. 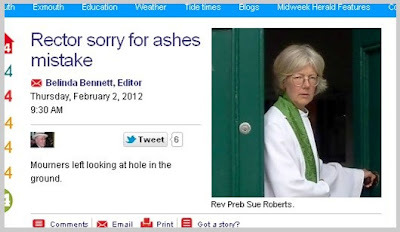 Sue Roberts forgot to officiate at the graveside committal of a prominent hotelier. The service had been planned six months ahead and family members were in attendance from the US and France. The Rector rescheduled the committal for the next day, but the moment was lost and some kin were already on their way home by then. I feel so sorry for the grieving family. This service was scheduled on an anniversary when all would be in attendance. A benefit of cremation is that these things can be planned to accommodate our schedules. The Undertaker called close to the date to remind the rector too. How difficult can it be? What more could possibly have been done? Personally, I know that I've lost weeks of my life to worries about clergy, whose M.O. is showing up ten minutes before the service starts, and I've seen them show up late and even forget altogether. I've got a generic service ready to go in these situations, and have had to dig a grave by hand ( for ashes!) when the cemetery crew made a mistake. Still, my heart goes out to this Rector, and indeed to anyone who makes a simple human mistake at a time when every detail needs to be right. You forgot and you're sorry. You feel for the family and wish you could do something to make it right. Do they have to flash a camera when you open the door and splash it on the cover of the newspaper? Ouch! Back from a heavy day (cremation). Certain songs are real tear jerkers in certain situations. Wish I could go to the funeral. My boss died last week. I went to his funeral today but was asked to leave. Apparently taking photos & throwing confetti is for weddings. Really confused as to how Damien Hirst managed to get Zooey Deschanel sealed in a plexiglass vat of formaldehyde for his latest exhibit. "I'm sorry" and "my bad" mean the same thing... Unless you're at a funeral. @kam86cu WTF, who gets open casket post autopsy!? I'm organ donor + cremation. FYI. I'd choose cremation, but I'm lactose intolerant. finna go to my uncle funeral man R.I.P uncle markie! Picked up my cat's ashes from the vet. I suspect that pet cremation is a scam. Well, it would be if I ran it.